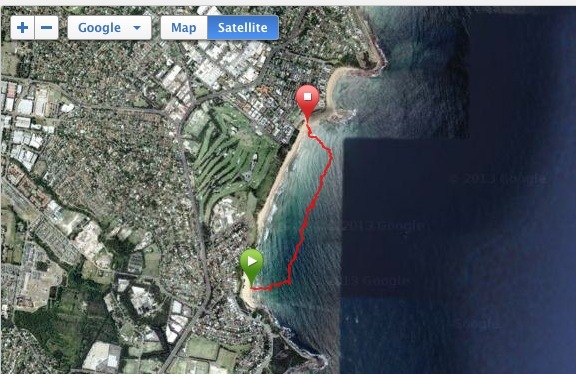 I’ve never done the Mona Vale swim before. It has a reputation as being a tough one, but definitely didn’t live up to it’s bad boy reputation this year. The usual carpool suspects were all out of action – Ronene’s been jetsetting for work, Fiona’s been out for a little bit (something to do with a big story about having a baby), Vanessa has been sick, Sonja had plans, and Allison already had a ride. So I rode the motorbike up the coast for a change. Made parking a breeze! There wasn’t a huge contingent of 4SEASons swimmers there. I kind of get it – it’s a fair way to go for a 1.6km event. I rocked up and spotted the motley band in orange and blue waiting for the shuttle bus to take us to Warriewood (race is a destination swim from Warriewood to Mona Vale). I ducked into the change rooms to get my motorbike gear off and my swimming gear on, and when I came back out the bus had arrived and was full so I had to wait for the next one. All on my own! By the time the next bus came, we got down to the beach, did a bag drop and a quick dip, it was time to start! All a bit of a rush really…I usually like just a little time to collect my own thoughts! Should have walked around if I’d known how long that second bus was going to be, so it was my own fault really. The race itself ran smoothly. There wasn’t much in the way of surf or swell or chop. The buoys were easy to spot and the course well marked. I felt pretty good and arrived at the other end before I knew it! So all in all it was a pretty good event. I just came away from a bit dissatisfied and it took a bit of thinking to figure out why. I think that really where i’m at right now, a 1.6km isn’t enough of a push for me. Or I need to really dig in and consider that sort of distance a sprint. Just something to mix it up and make sure I don’t phone it in. Time to make sure I push myself in the shorter races as well, I think!